Doing a program to detox skin will make your skin feel refreshed, renewed, softer and smoother, dewier and healthier! However, the most important benefit is making your aging clock run backward not forward. Getting toxins out of your body is one of the most important elements of any anti aging program. The best substance to pull toxins out of your skin is clay. Nothing can compare to clay’s ability to detox your skin. However not all clays have this property. Here’s an interesting side note about clay. There are five known places around the world that have documented evidence of people living well over a hundred years with good health and vitality: they are located in the Himalayas in China, the Urals in Pakistan, the Caucasus in Georgia and Russia, the Andes in Peru and Ecuador, and the Wasatch mountains in Utah. It is interesting to note the association of deposits of a certain class of mineral rich clays at these places. There is evidence of some of these people living to 140 years of age. This unique mineral rich clay is perceived as one of the main reasons for this longevity. The agricultural crops produced in these areas taste better, grow faster, and are more resistant to diseases. Mineral rich clay is proven to enhance the enzyme production in all living organisms. They are also used to detox because of their unique properties. Another interesting note about clays is that radioactive waste is stored packed with clay and can pull radiation out of your body. Certain types of clay after becoming hydrated with water have a negative electrical charge; anything they come into contact with that has a positive charge is pulled into them like a magnet. Most of your toxins, harmful bacterial, viruses and even radiation have a positive electrical charge thus allowing the clay to absorb them. Because of this quality anytime your using clays to Detox skin always use fresh spring water. Any water that has even traces of chemicals or toxins in it will compromise the clays ability to pull toxins out of your skin. 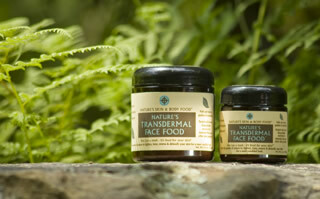 An excellent product to use to Detox Skin is Nature’s Transdermal Face FoodTM. Only fresh spring water is used in its production. It also contains that unique rare mineral clay found at one of those five locations where a person living over a hundred is rather common. But it also contains more bio-available minerals than any other clay deposit that can be absorbed directly through the skin. It’s only available in Nature’s transdermal Face FoodTM and it not only will pull out toxins but will push in a vast wealth of nutrients your skin can instantly use for renewal. The anti aging effects of this product are profound. Here are some other natural ways to remove toxins from your skin. Your skin disposes approximately 10 percent of body toxins through sweat, thus, the need for exercise. In addition, your skin transforms toxins into water soluble compounds that the kidney can easily remove. As such, when you detoxify your skin, you are also helping the rest of your body detoxify itself. After all, your skin serves as the gateway for toxins going in and toxins going out so it makes perfect sense to detoxify it first! When your body has been detoxified, thanks in part to detox skin processes, you promote an enhanced immune system. You are better able to fight minor infections like cold and flu since your immune system is functioning at its optimum level. Of course, you must adopt a healthy lifestyle eat the right foods, engage in moderate exercise and manage your stress which helps to promote a healthier body. And when you have a healthier body, you can delay the diseases of ageing like neurological disorders and heart illnesses. If you are trying to lose weight, skin detoxification is for you. Keep in mind that fat cells are a safe place for your body to store toxins. Pulling those toxins out reduces the need for fat cells so now with some exercise you can burn them up. Also you’re going to feel better. Toxins, free radicals and heavy metals are three of the body’s worst enemies in terms of premature ageing. Whenever you engage in skin detoxification, these harmful substances are removed from your body and exits through your skin. Ultimately, you will benefit in the form of skin that feels smoother and softer to the touch and looks younger and firmer. Plus, it does not hurt to be pampered with massages and spas once in a while! The most important reason for skin detoxification is a better quality of life. Due to your detox skin sessions, your body will feel and look better than it did when you allowed toxins to build up in it. You will feel more energized to take on the challenges of life, maybe even go on adventures you have only previously dreamed of. All these because you decided to take care of your body from the outside going inside! Your smoother and softer skin is often just the bonus in skin detoxification. The most important thing is that you regain your good health.